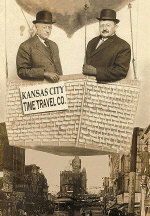 With 200 photographs of people and places that until now have been long forgotten, Early Kansas City, Missouri, part of Arcadia Publishing's Images of America series, tells the history of a frontier outpost that became an important and vital metropolis in the Heart of America. The son of the world's most notorious outlaw is accused of being the leader of a gang of bandits that robbed a train in Kansas City. Will James A. Reed be able to put Jesse James, Jr. behind bars?